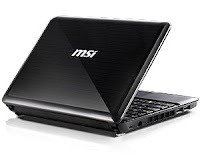 MSI L1350D-1672US, the sleek and ultraportable netbook weighs only 2.4 pounds. This netbook features a 10-inch display with WSVGA (1024 x 600) resolution, Intel GMA 3150 graphics card, Intel Atom N455 processor, Intel NM10 chipset, 1GB memory, and 160GB SATA hard drive. MSI L1350D-1672US is equipped with 4-in-1 card reader, 1.3 MP camera, three USB 2.0 ports, VGA port, 3-cell battery, and HD audio. Height : 0.74 - 1.24"